My husband and I decided to go on a diet. After the holidays we both had put on a couple of pounds. Okay, maybe it was more than a couple. I knew that I had been feeling extremely bloated, exhausted, grouchy, etc. I thought I would follow in my sister's footsteps and cut out wheat and sugar. We are on day 4 and I feel so much better! No more bloat, I have a ton of energy, and I can actually remember things. I think this is going to work! You may wonder what we are eating, well it is a lot of veggies and fruit with lean meats and grains that aren't wheat or have a high glycemic value (think white rice). I thought I would share with you one of our favorite meals, that is perfect! My husband loves cheeseburgers. He could eat them every day. Every. Single. Day. In the spring, summer, and fall he grills every chance he gets. This salad is perfect in recreating the cheeseburger experience without eating the bun. 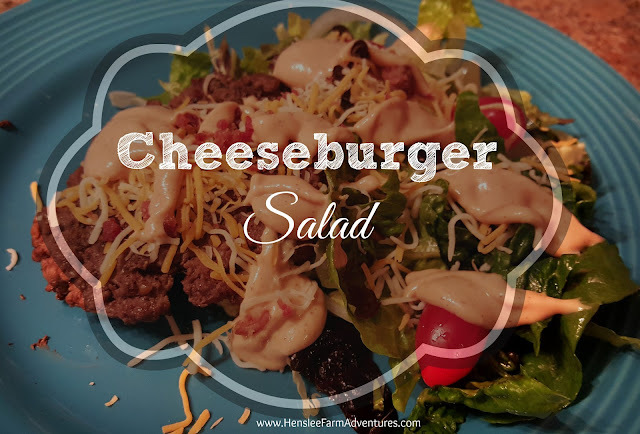 The first thing to do is to make a basic salad based on what you would put on a cheeseburger. Here are the ingredients that I used. If you want to be authentic about it, I would use iceburg lettuce shredded, and a red onion. However, this is what I had on hand. 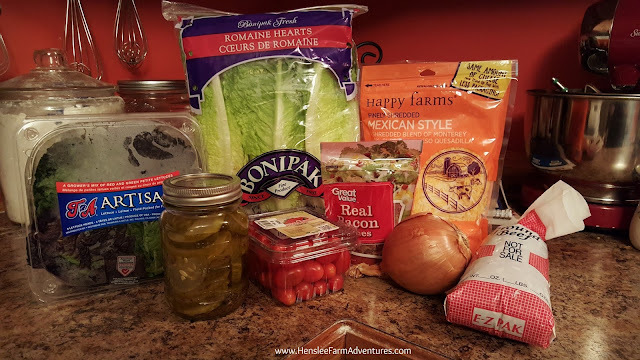 I love romaine and I also love to get the artisan lettuces that Aldi has, so since I had both, I used both. Then I added cherry tomatoes (they were on sale), homemade dill pickles (lime pickles would also be yummy! ), shredded cheese (any kind you like or have), and of course some bacon pieces. You could also make it into a mushroom swiss burger salad by using swiss cheese and adding mushrooms to the mix. This looks yummy just like it is! After your salad is made and chilling in the fridge, then get your burgers ready to cook. Since it is winter and extremely cold at the moment, I got out the stove top grill to grill up my burgers. It's not quite the same, but it's better than nothing! You can find a great burger recipe here. Or just season up your burgers how you wish. Besides using my go to recipe, I also like to use Cavender's Greek seasoning. A friend of mine got me started on this seasoning and it is great on hamburgers and steaks! 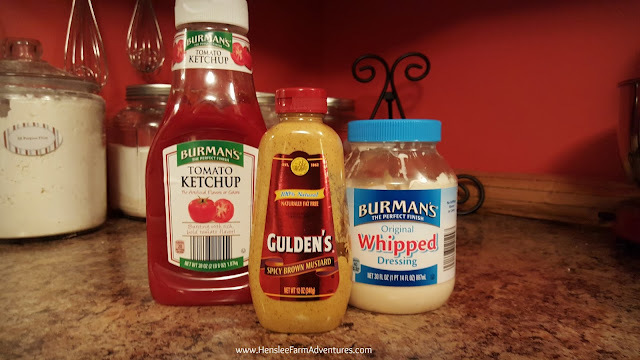 While your burgers are cooking, you can make the dressing. The dressing is of course, what you would put on your cheeseburger. You can see from the picture above that we used spice brown mustard. 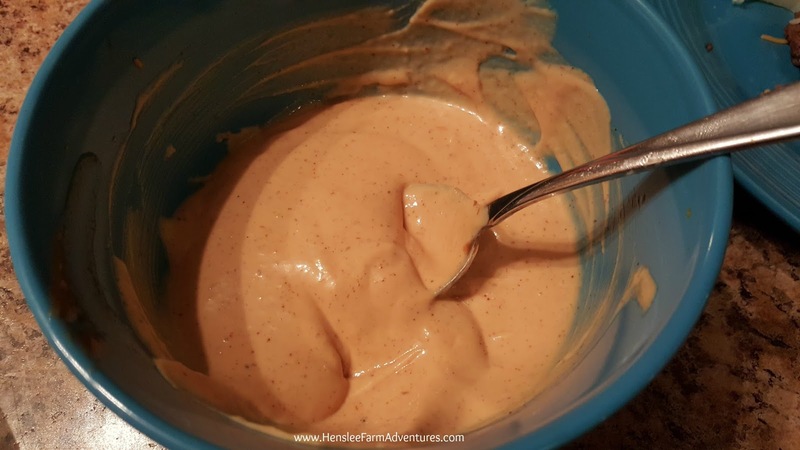 I actually prefer Dijon mustard in this recipe, but I didn't have any on hand. You can also use just regular table mustard. If you would like you could also add in a little relish to your dressing as well, but we don't care for that. If you want to play around with the amounts, go ahead. Be sure and taste the dressing and adjust to suit your tastes. Dressing, just waiting for that delicious salad. All that is left is putting it all together. I don't put the hamburger patties in the salad. 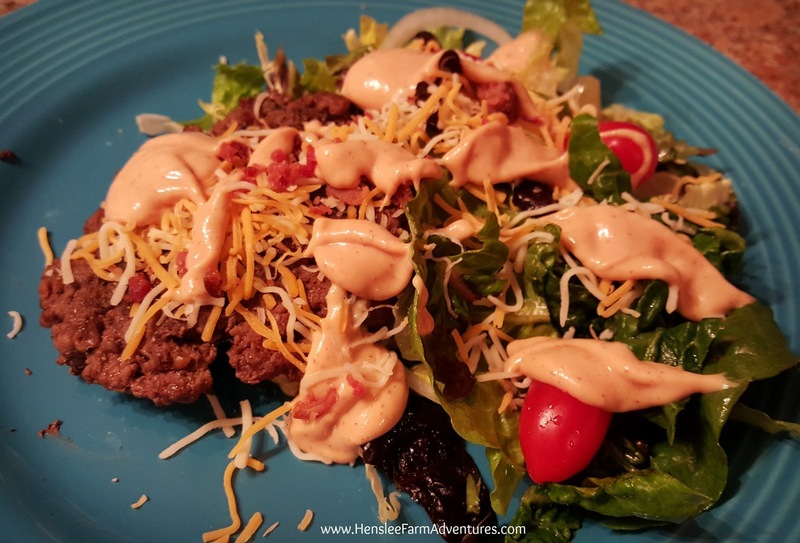 I like to put the salad on my plate, then the hamburger patty, and top it off with shredded cheese, bacon pieces, and the dressing. This really is a great salad. It is really good during the summer when you can grill the burgers outside and also grill some onions while you are at it. 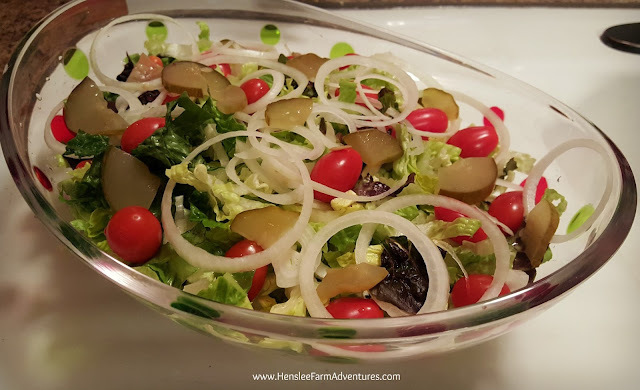 I hope you try this recipe out and let me know what you think!